We paid a visit to Jones the Grocer to discover what they have in store for the festive season. This gourmet providore is known for its walk-in cheese rooms, which are packed to the rafters with soft and hard wedges from around the world. So, to help make entertaining a breeze this Christmas, we asked the fromage fanatics at Jones the Grocer to share the anatomy of the perfect cheese board. 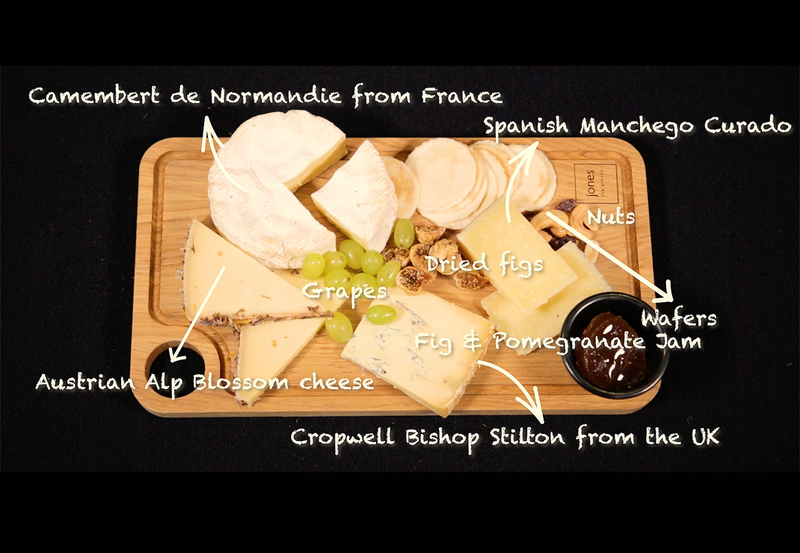 Take a peek at this video, and then discover the delicious cheeses below. Manchego curado: a hard ewe’s milk cheese from Spain with a sweet, nutty flavour. Delicious served with quince paste or the Jones the Grocer Fig & Pomegranate Jame. Alp Blossom: a delicious, semi-hard cow’s milk cheese from Austria, coated in a fragrant blend of flowers and herbs, including dried cornflowers, lavender, marjoram, lovage and chervil. Cropwell Bishop Stilton: a smooth and mellow blue cheese made in the UK from premium cow’s milk. Camembert de Normandie: a delicate French cheese with a white bloomy rind and a creamy, runny interior. To complete your cheese board, serve with crackers, wafers or sliced baguette, and garnish with dried figs, fresh grapes, nuts and Jones the Grocer Fig & Pomegranate Jam. To shop for artisan cheese and gourmet ingredients, head to one of the 13 Jones the Grocer stores in the UAE, including locations in Abu Dhabi, Dubai, Al Ain and Sharjah. For more Christmas inspiration from Jones the Grocer, shop for a range of gourmet hampers in-store and online.